R.J. (Bob) Gill has been singing since the age of five and turned professional at the age of 28 after varied occupational experiences. During his successful stage career he entertained enthusiastic audiences throughout Ontario and has released four well-received recordings. Bob also has numerous talent contest wins to his credit and was ranked in the top 5 country singers in Canada at The Canadian Country Open. He has also performed in Nashville at Broadway Music Hall and the popular Tootsie’s. Bob’s music has been most influenced by none other than Waylon Jennings. 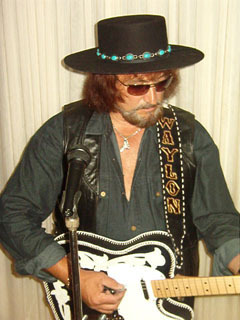 Bob maintains an up to date repertoire of Waylon's music and currently performs most songs ever released by him. Since Waylon's untimely death in February 2002, Bob has had an inner desire (and destiny) to focus exclusively on preserving to eternity the music of his idol. He has concentrated on following the recommendations of his many fans by perfecting a Legends Waylon Jennings tribute show; and, has done so with his usual success. When you look at Bob on stage, you think immediately of Waylon. When you hear Bob sing Waylon’s music and close your eyes, you are immediately positioned in the midst of fans at any one of the late and great performer's concerts. Bob, like Waylon, sings with a style that seems to come from the soul and reflects both the joy and the pain of a man who has experienced each. The keen understanding of the moods and sounds of the common people, of which he considers himself a part, shines through on stage and off. Bob keenly looks forward to performing in your area in the near future. When you hear a live show and it sounds like Waylon, stop in and pull up a chair for a memory packed show you won’t forget. You could be hearing R.J. (Bob) himself paying his heartfelt respects to the one and only Waylon.